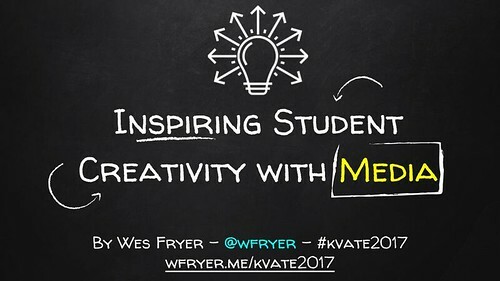 This podcast features a recording of Dr. Wesley Fryer’s opening keynote address at the 2017 KVATE (Kaw Valley Academy of Technology and Education) Conference on July 24, 2017, in St. Marys, Kansas. The title of the keynote was, “Inspiring Student Creativity with Media.” In addition to highlighting examples of “WOW work” by students (borrowing a wonderful term from Seesaw professional development coordinator Angela Gadtke @MrsGadtke) the keynote also included a “digital magic trick” demo using the new iOS app by Microsoft, “Seeing AI.” Google Slides shared during this keynote, including links to all referenced student examples and other resources, are available in the podcast shownotes or directly using the shortened web link http://wfryer.me/kvate2017. Check out the podcast shownotes for additional KVATE resources and links. If you listen to this podcast, please provide feedback to Wes either with a comment on this post or by sending a Twitter reply to @wfryer. Thanks for listening to Moving at the Speed of Creativity podcasts! Please subscribe using PocketCasts or in your own favorite podcatcher application. #kvate2017 LOVE this tip from @DDellere: Use ShoutKey https://t.co/BoM40c9T8J to share EASY time-limited shortened links with students!